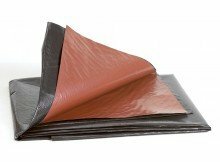 Polyex liner is ideal for all low budget applications, can be reversed for a brown or black finish. Made from strong materials for a durable and long life. Comes with a 15 year guarantee against faulty manufacturing. If you have any questions about this product by PondKraft, contact us by completing and submitting the form below. If you are looking for a specif part number, please include it with your message.